If they need to use sheet or workbook events, they add those events to the appropriate module and then call macros in the code modules from those events. The advantage here is that it is easy to see all your code in one place. You can add comments to macros that are called by event procedures so you know how the macros are run.... If they need to use sheet or workbook events, they add those events to the appropriate module and then call macros in the code modules from those events. The advantage here is that it is easy to see all your code in one place. You can add comments to macros that are called by event procedures so you know how the macros are run. 17/09/2014 · Re: Calling Worksheet Change Event Directly from VBA Originally Posted by RoryA The code in that thread shouldn't trigger any events since you disabled them, but you didn't post the code for the routine it calls (UpdateDashboard).... 8/11/2011 · One of the modules (Module 4) contains a sub that calls a sub in another module (Module 2). If the sub in Module 2 is public, it executes. If it is private, then it says it is not found. Is that by design? Do I really have to have them in the same module if they are private? 12/11/2005 · I have a Form that is set to visible=false while a save confirm Form is displayed. When the confirmation is complete the confirm Form is closed and the hidden how to change opening balance for credit card in quickbooks Before you try to run the Application.Run line that call a macro or callback in another workbook or add-in you can test if the workbook or add-in is open with the code below. If they need to use sheet or workbook events, they add those events to the appropriate module and then call macros in the code modules from those events. The advantage here is that it is easy to see all your code in one place. You can add comments to macros that are called by event procedures so you know how the macros are run. 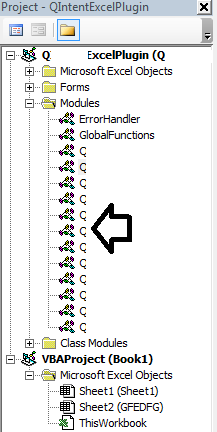 17/09/2014 · Re: Calling Worksheet Change Event Directly from VBA Originally Posted by RoryA The code in that thread shouldn't trigger any events since you disabled them, but you didn't post the code for the routine it calls (UpdateDashboard).